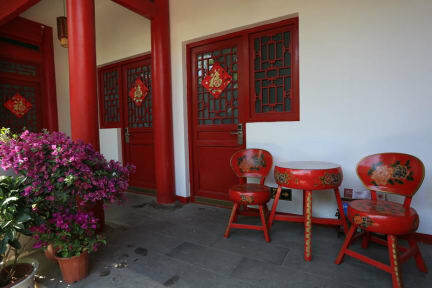 Beijing Yue Xuan Courtyard Hostel i Beijing, Kina : Boka nu! Cozy hostel in the old, traditional parts of Beijing - but still close to the rest of the city thanks to the metro station nearby. The common bathroom was ok but not super fresh. We recommend to book a tour to the Great Wall through them - the bus picked up people from other hostels and did then go directly to the wall. Heard stories about tours where 2 h are spent at the wall and 6 h at a shopping mall.